Hotel Rudraksha Palace is one of the best hotels located in Kausani. Kausani is a famous Hill Station, often referred as Switzerland of India. At an altitude of approximately 1879 meters from the sea level, guests can enjoy the panoramic view of beautiful Himalayan peaks including Nanda Devi, Panchchuli and Trishul from Hotel Rudraksh Palace. Mahatma Gandhi visited this place in the year 1929, influenced by beauty of this place, he named it as Switzerland of India and wrote a book titled "Anashakti Yoga". 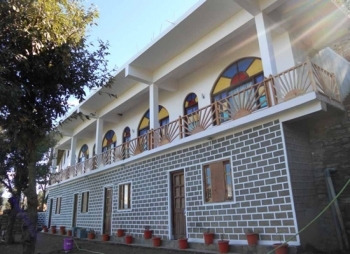 Guests can plan a visit to Anashakti Ashram, Rudradhari Waterfall, Lakshmi Ashram, Sumitranandan Pant Gallery etc. They can enjoy trekking at Pindari Glacier, Kafni Glacier and Sundar Dhunga Glacier. Star Gazing, Nature Walk, Jungle Trek, Bird Watching are some other activities guests can enjoy at Kausani. Places of Excursion from Kausani are Bageshwar (38 kms), Someshwar (35 Kms), Binsar (38 Kms), Ranikhet (76 Kms), Nainital (119 kms), Almora (47 Kms) etc. The hotel is located near Tea Garden on Kausani- Baijnath road, at a distance of 2.5 Kms from the main market of Kausani. 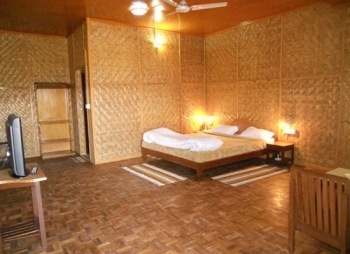 The hotel offers 08 well appointed rooms with wooden flooring. All rooms are divided in categories named as Machan Deluxe, Deluxe, Executive Deluxe and Duplex rooms with modern amenities like Room Heater, Cable TV etc. Each room offers magnificent view of great Himalayan peaks. There is a multi cuisine restaurant at the hotel that offers variety of yummy dishes. By Air: The domestic airport of Pantnagar is the nearest airport to reach Kausani. It is at a distance of 168 Kms from Kausani. Flights to reach Pantnagar from Delhi is available on Tuesday, Wednesday, Friday and Sunday. From Pantnagar Airport, Visitors can make use of Taxi Service, to cover the remaining distance. By Train: If you want to cover your journey by train, you need to reserve seats for Kathgodam, the nearest Railway Station to Kausani, at a distance of 137 Kms. Trains to Kathgodam are available from Delhi, Dehradun, Lucknow etc. Delhi is at a distance of 248 Kms from Kathgodam. From Kathgodam, Taxis to Kausani are easily available. By Road: The best option to reach Kausani by road will be to book a taxi/cab from Delhi and follow the shortest route via Hapur- Moradabad-Thakurdwara- Kashipur-Ramnagar- Ranikhet-Kausani. Distance covered by you will be 401 Kms and it will take around 7 hours. Another option is to board buses for Kathgodam or Almora and take a taxi from there to reach Kausani.